Oenophiles are devoted to wine. Oenophilia (/ˌiːnəˈfɪliə/ EE-nə-FIL-ee-ə; Greek for the love (philia) of wine (oinos)) is a love of wine. In the strictest sense, oenophilia describes a disciplined devotion to wine, accompanying strict traditions of consumption and appreciation. 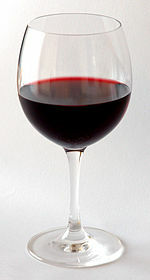 In a general sense however, oenophilia simply refers to the enjoyment of wine, often by laymen. Oenophiles are also known as wine aficionados or connoisseurs. They are people who appreciate or collect wine, particularly grape wines from certain regions, varietal types, or methods of manufacture. While most oenophiles are hobbyists, some may also be professionals like vintners, sommeliers, wine merchants, or one who tastes and grades wines for a living. The word did not exist in the wine lexicon until 1977 when Shirley Copperman coined it for her new bring-your-own-wine restaurant she and her husband dubbed "Oenophilia", located on the upper West Side of Manhattan. A reviewer in a local paper, The Westsider, wrote about the debut: "If the name suggests a rare disease you wouldn't want to catch, a sign in the window informs you that you may already have it. 'Oenophilia', it says, 'is an affliction of the senses characterized by intense cravings for good food and service and vintage wines served in a tasteful, comfortable setting at reasonable prices.'" The reviewer from The Village Voice wrote in 1977: "Oenophilia. No, not a social disease. It's the sensual orientation towards the pleasures of fine food and wine, and the name of a spiffy new bistro for elegant gourmandizing....'"
^ "Oenophilia". Dictionary.com Unabridged. Random House. Retrieved 2016-01-22. 4. What is an Oenophilia?